This month is brake month in my garage. The brake lines have been disconnected, sanded down to a fine surface and await a coating of clear enamel. They had some black over-spray from the engine compartment on them and that's the kind of thing I like neat looking. No half measures here. I started with 180 grit, then switched to 400 and finally a hit with 1000. A vigorous polishing with metal polish and cleaning off with lacquer thinner. New parts have been sourced for the master cylinder, rear brake cylinders and flexible brake lines. Caliper rebuild kits are being employed to revive and restore the braking to as-new. I have all rear tail light bits back on the car. New lens were used. You should always buy new lenses when you get your painted- it gives it that "new car" feel. 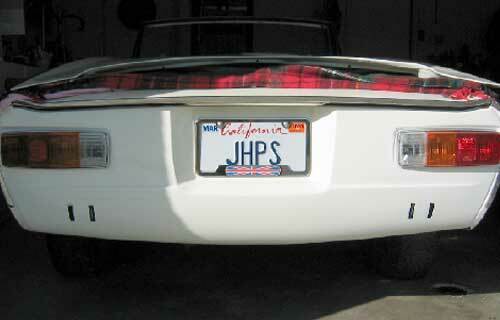 My, new super-deluxe-only-the-most-expensive-cars-get-this-license-plate-frame complete with Union Jack is now installed too. In other things, I was just about to take a couple boxes of parts off to the powder coating place when our Land Rover was broadsided by a lunatic uninsured motorist who ran a red light. No one was hurt fortunately, but we'll be out-of-pocket for hundreds of bucks for repairs for the deductible, so the powder coating needs to wait a while longer, grrr.